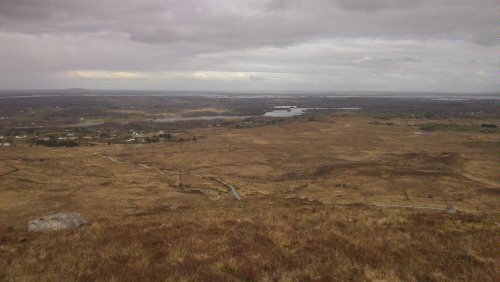 Saturday had arrived and I left my house around 8.15am to head to Letterfrack in Connemara for the start of the Connemara Rough Diamond. This was a race I had never competed in and was looking forward to the challenge. I was happy to see a few of my fellow competitors lining up at the start. The weather was breezy but fine at the start. We set off running and myself and Shaun Stewart took up the lead towards Diamond hill. An ascent of around 400metres took us around 22 minutes. The ground was mostly paved and gravel track as this is a common tourist hike. We had to shout and clap a few times to clear the tourists out of the way. Shaun started to make some headway on me around the foot of the mountain and I started to feel my lack of hill training of late may not pay off. I managed to summit in 2nd place and took off for my favourite part, the downhill run. It was very tricky with a mist now falling and the paved slabs were like ice sheets. I passed an old school mate on the way down and a big high five gave us both a laugh and a boost! I reached transition one in 42minutes and set off on the bike a few minutes behind Shaun. An 8km road bike out to the next stage which was an obstacle course in the woods. Craziest part of any adventure race, I reckon. There were zombies jumping out from behind trees, climbing walls, balancing sections, dark tunnels and sumo wrestlers in the bog. Now thats an obstacle course! Back on the bike and a 13.5km spin out to the beach. This cycle was mostly flat with some really fast sections so a little recovery before hitting the beach and an 8k run. I hoped off the bike , dibbed in and set off for an 8k run, not having a clue of the course ahead. I was still about 4 minutes down on Shaun but I was feeling good. I hit down the beach with a tail wind, knowing that would be different on the way back, keeping a steady 4 min 10 per km. The marshal guiding us on the beach even ran with me for a bit, in his wellies, for a bit of support. Then it was off the beach, over some rough ground, through a river or two, up a little hill, some more rough terrain and back down to another beach called Glasillaun. A run to the end of this beach, a quick dib in and then we turned to face the journey back. It became clear on the beach the difference between people. Shaun passed me about 5 minutes ahead and 3rd, 4th and 5th were all about 2 minutes behind me. I knew it was going to be tough to hold these guys off, especially the guy in third who is very strong on the bike. I left the first beach and started the rough section back. My dibber fell off a few minutes late. I stopped picked it up and hit off again but seconds later all hell broke loose as my ankle buckled under me. I thought things were over but as I got up and moved it was sore but managable. I had 3k to go on run and then it was on the bike all the way home. All I could think of at this point was Scott Jurek’s book, Eat and Run, and how he ran an ultramarathon on torn ankle ligaments. All I had to do was run 3km on a slight sprain. My pace slowed and the head wind was a killer but I made it to the bike, in quite alot of pain! The last leg on the bike was as tough as the last 3km run had been. A strong head wind, rain and some nasty hills really took their toll. As I passed the 2 km to go sign I felt I would hold on for 2nd place. Just then I looked behind and their was Martin Flanagan, last years course winner, and winner of Sea to Summit 2013 breathing down my neck. He passed and I told him to take it home in style. I made it to transition about 30 seconds behind Martin and the last run wasn’t long enough to make up the ground. I finished some 20 seconds behind but I was delighted to be there. A podium finish feels good and to beat yourself mentally after the injury as well as a race where I had been very much alone on the course all day felt good too. All in 2 hours 53 minutes and 3rd place. If any one is looking for a West of Ireland race this is another cracker, it has almost everything and today even the weather decided to go West of Ireland crazy. I will get my hands on some photos and a full list of results when they are up! Finally a chance to get to the blogging again. Sorry folks for the lack of updates over the past week. It’s been a busy one to say the least. Training went really well with two touch brick sessions early in week and then with work busy I had a break from training Wednesday to Friday before the race kicked off Saturday morning. So the question is where do I start! A fourth place finish in tough wet and windy conditions in 2013 meant I knew I would be in with a shout of the top three this year if things went well and of course depending on the oposition in the field. Preparation is key and last week wasn’t the best, I have been working 12 and 13 hour shifts, some at night and some during the day and juggling a bit of sleep and training in. All in all however I was feeling strong and ready to give it everything. 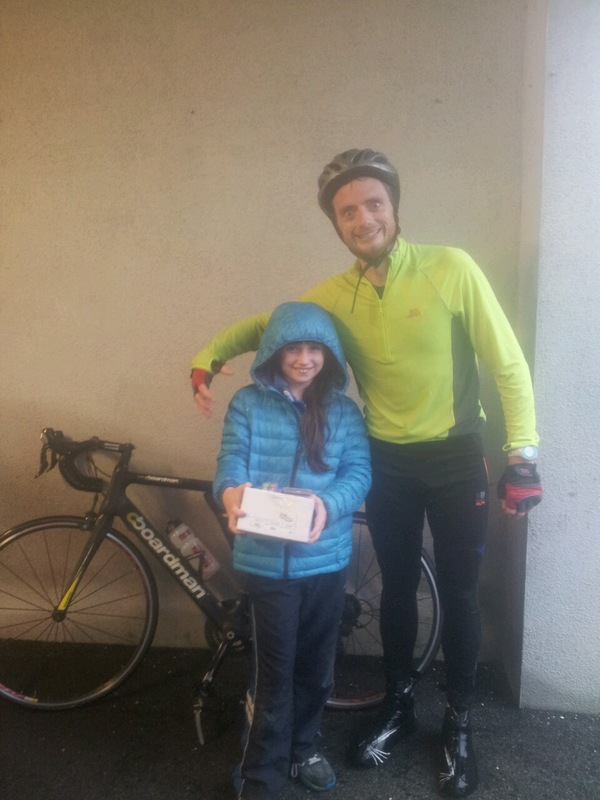 On Friday evening, Emma and I made the long journey to Letterkenny to register , drop off bike at transition and find our B&B in a little village close to the bus pick up for the morning. A stunning part of the country and the B&B was really nice with fantastically helpful owners. It turns out it is only three weeks open. I’ll post a link later in case anyone fancies a trip North! The race consists of a 15km trail run, 2km kayak, 25km bike, Mount Errigal climb,18km bike including off road section, and finishes with a 1km beach run. 64km in total. At 7am I hopped on the bus to take us to the start line. After a quick toilet stop, a sprint/warmup to the start line and a few minutes of being served up as midge food the hooter sounded and we were off! The first 4km is a fast downhill section and I quickly slotted into 2nd place and tried to find my rythm. The pace was fast but I felt relatively comfortable and maintained about a 20-30 second gap on the man ahead for the entire 15k. We averaged 3.10 minutes per kilometer for the downhill section and later settled into 3.45’s and 3.50’s . An incredible run past lakes, mountains, a castle, and up over the hills through bog before descending to Garton Lake where the kayak stage took place. I completed the 15km bang on the hour mark and felt good as I splashed out into the lake to jump onto the kayak, hot on the heels of the man ahead. 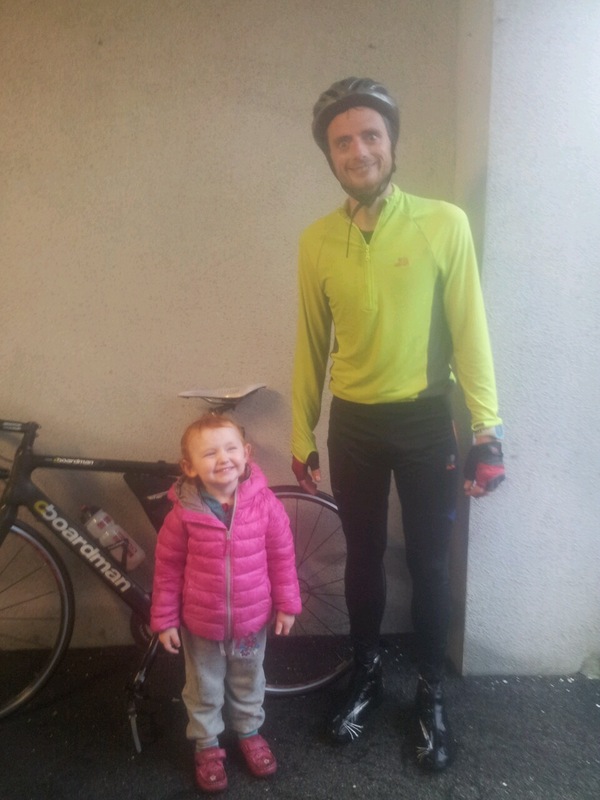 Shaun is a great adventure racer and I knew I had my work cut out to catch the local hero! After an easy kayak section I was closer and as I headed to the bike transition I felt in better condition than I had a year ago at this stage. I caught Shaun within a few minutes on the bike and we agreed to help eachother over the bike stage. This turned out a good tactic and even though I had to put up with constant cheers of “go Shaun go” it was the best decision for us both. We reached the foot of the mountain stage in 47mins. I hopped off the bike and to my embarrassment took a right instead of a left, tried to turn quickly and landed face first on the gravel. A nice start to the mountain run or what ! As always the mountain is energy zapping and tough as hell but we summitted together in 27minutes and the descent began. I wasn’t in the right frame of mind at this stage. I knew it but I couldn’t get it out of my head. My fall in the Dingle race 3 weeks ago was still fresh in my mind. I made the worst mistake of thinking too much and within a minute of the descent I fell again, landing on both knees. Another sore one and Shaun, after asking if I was ok, gained nearly 50 metres on me. I dusted myself down once more and decided it is now or never, stop thinking about things and get on with it. I completed the descent in 11 minutes and passed Shaun at the bottom of mountain. I later heard the views were amazing from the top! Back on the bike again and the final section awaited. Shaun was back with me at this stage and we attacked the off road section together. At this stage Shaun had a little more nerve and attacked the second half of the offroad with real gusto. I lost a few seconds on him which would prove the difference in a few minutes time. I kept him in my sights as we blew the last 10km of the race apart. I could see him cross the line 40 seconds ahead of me. I finished in 3.14 hours, 19 minutes faster than last year. Apart from extreme pain all over my body, I felt fantastic. All that training does pay off and there is no better feeling than crossing that line knowing you have beaten yourself once more ! More photos to follow later and a few interesting links and plans for the next few weeks..
Race prep. 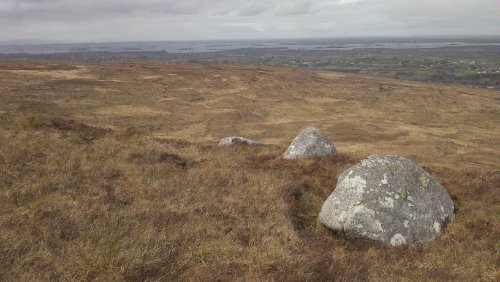 Connemara Adventure Challenge. Saturday is race day so after a nice bike and run session yesterday it is mostly rest today and tomorrow. I had a good bike session yesterday testing out a borrowed mountain bike I am using for the race. This race includes a 16km cycle 9 of which are very rough and I have punctured 2 years running so this year for the sake of losing a few minutes I am going heavy duty! My run yesterday was a steady 10km in 38 minutes , not pushing full pace but feeling good after my week of beach training. I will post some pre race pictures tomorrow at registration. Let the games begin! Below is a link to my training sessions in the last week with emphasis on running. The real bike work begins from next week onward. I decided to tackle a few hills today so I started this 45km route from Oughterard up over hills down towards Rosaveel and back over the same route. It was a tough session with some awful hail showers along route. The course was dotted with sheep and lambs who looked at me as if I was fully nuts. 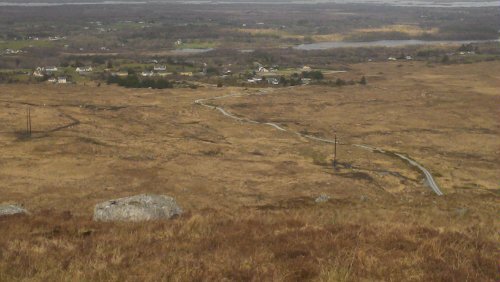 I wasn’t as prepared as I usually am with gear and on returning to Oughterard I couldn’t feel my feet and my hands weren’t far behind! The plan is to tackle this route a few times over the summer, however the road surface is awful and my bike won’t appreciate it much. My plan for today is to try a small run to test out the injury. My feeling is it is fine however I don’t intend on rushing back. A little heat in portugal and some barefoot running on the beach and all will be well ! A long day at work today so I literally ran in door and back out again on the bike. It was a cold spin out the coast into a nice head wind but all in all a good session and feeling good considering match yesterday. I plan to climb Carrauntoohill, Ireland’s tallest mountain on Thursday. I am working the weeks training around this so a good gym session with a run along with soccer training tomorrow, and a rest day Wednesday should set me up nicely ! 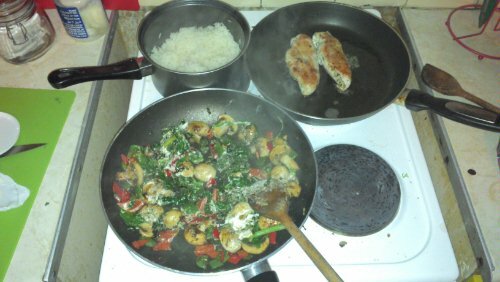 A nice healthy dinner tonight. 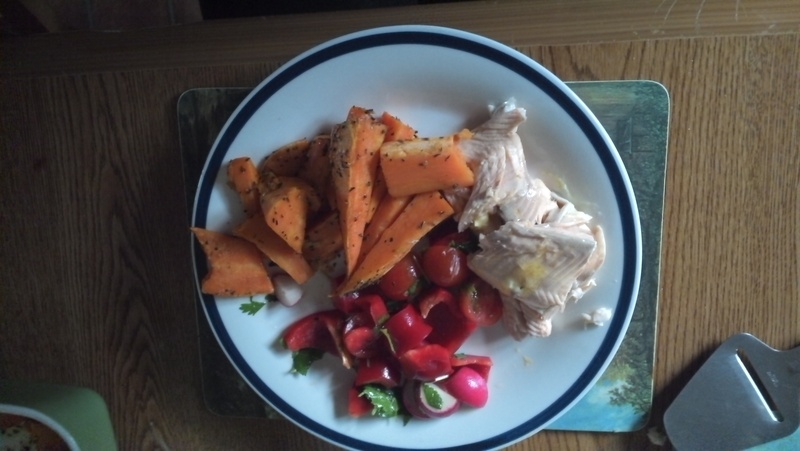 Recipe : Wild trout, “caught myself!”, sweet potatoes with herbs and chilly, and a salad with radishes,red peppers,wild garlic, fresh coriander, fresh mint leaves, lemon juice and some rapseed oil. Some salt and pepper added to all.